Not very many people know that there are many essential oils that are just as good or better at repelling bugs than commercial insect repellents. Some include: Citronella, Clove, Lemongrass, Rosemary, Tea Tree, Cajeput, Eucalyptus, Cedar, Catnip, Lavender and Mint. Essential oils in the citrus family are all strong bug repellents. Butterfly Express, the company I buy my oils from, sells an oil blend called "Away" that has many of those ingredients. 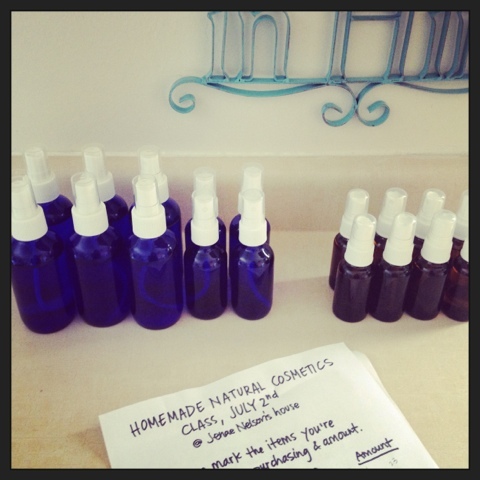 I have two recipes for bug repellent that I prefer and I will share them both with you. I made both of these at a recent cosmetics class I taught. This formula doesn't smell as good in my opinion (although many people like it) but is extra strength. This is the formula I took with me in Yellowstone. I didn't get a single bite and neither did my kids. The only one who got bit was my husband who didn't use the bug spray. I prefer this formula to the extra strength because it smells so yummy. However, it's not as strong as the first recipe. But when I've used it, it has worked perfectly. So as long as your not in the deep woods, this should be more than enough protection.